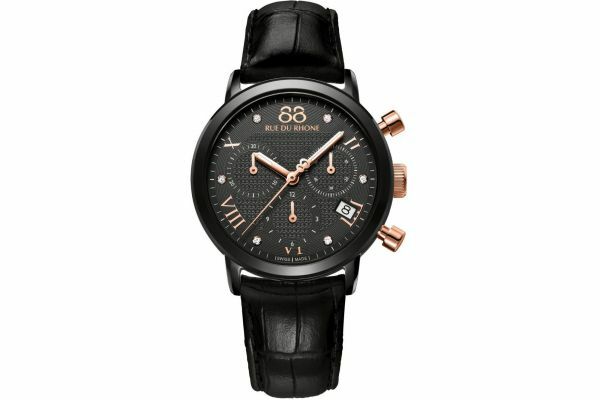 Ladies classic Rue Du Rhone black leather chronograph watch with a round stainless steel case. Has a black diamond set dial with the 8-filigree motif and stunning rose gold Roman numerals. Features a small seconds sub dial, 12 housr sub dial, 30 minutes sub dial and a date window. Has a shiny black alligator pattern strap with a stainless steel buckle. Powered by a quartz movement and comes with the Rue Du Rhone 2 year guarantee. This is the perfect timepiece for those city goers and those looking for quality and trend combined. 88 Rue Du Rhone 35mm Quartz Chronograph 87WA130005. For us to size your new 88 Rue Du Rhone 35mm Quartz Chronograph watch as accurately as possible, please take a look at our downloadable Watch Sizing Guide.